If you’re an independent creative professional, you probably already have a website showcasing your amazing portfolio. Portfolios are a necessary component of any freelancer’s website, and are often displayed right on the front page. A website is crucial for your marketing, but your prospective clients aren’t seeking you out for your skill and talent alone. 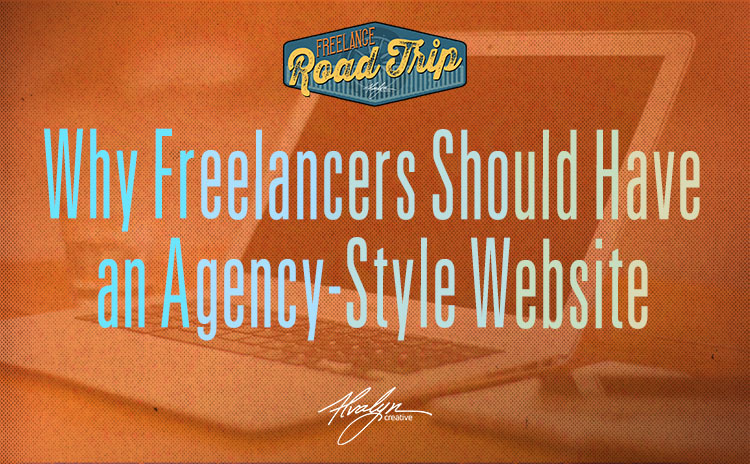 They’re looking for something else from you, which is why you should create an agency-styled website. Consider the purpose of your website. You have a website to attract clients. Your site is necessary to increase your exposure, build your brand and ultimately, generate profits. How you present your work and capabilities depends on who your target audience/ideal client is. There are tons of independent creatives all around the globe who do amazing work. How will potential clients, customers and fans decide who they want to work with or who they want to follow? As a marketing tool, your site should impress potential clients in the right way. Why are they coming to your website? What are they looking for… beautiful work? Or solutions to their problems? If your prospects want to work with creatives who solve their visual communications problems for them, you should tweak your site toward that purpose — problem-solving. Set yourself up as a creative problem-solver for your clients. Therefore the portfolio may not be the primary focus of your website. What’s the difference between a portfolio website and agency website? For the most part the content on both types of sites is identical. You’ll have a homepage, an about page, a client roster, examples of your best work, and what services you offer and where you’re located. The difference between the portfolio site and an agency site is in how this content is presented. 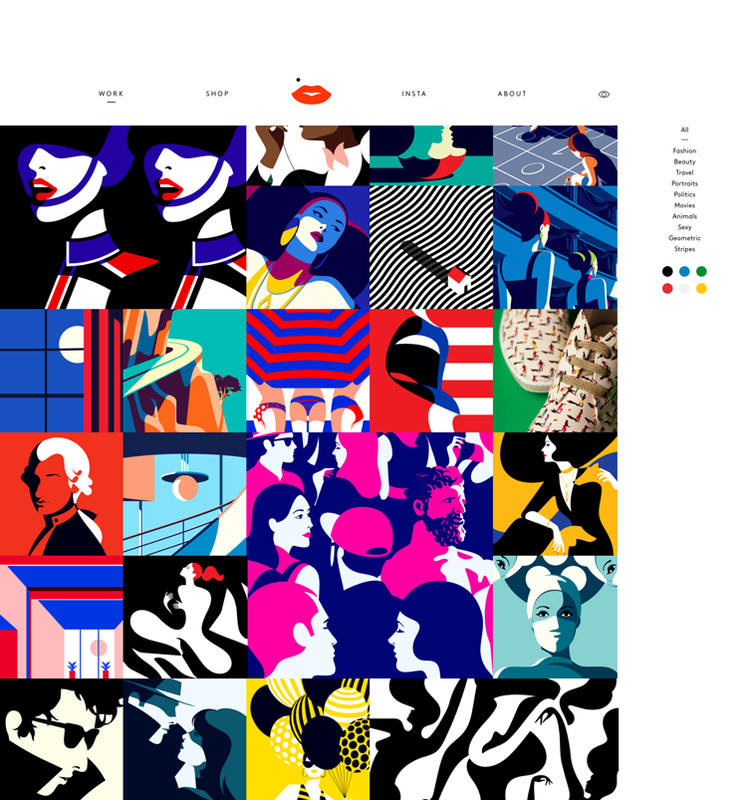 A portfolio site will focus on presenting the portfolio — the body of work. It will showcase your talents and visual skills. Portfolio sites work best for illustrators, fine artists, photographers, lettering designers, and other creatives who mainly work with agencies, publishers, or sell their work directly to consumers. An agency-styled site focuses on your problem-solving capabilities and services offered. Agencies work client-direct, and develop one off or larger scope projects to help their clients increase their bottom lines. Create a site to focus on creative thinking and visual communications solutions. What can you offer that will help your clients thrive and prosper? On an agency styled website the portfolio will have its own link(s) but it will not be the first thing visitors see on the home page. Instead of the portfolio, the first order of business is some sort of promise statement and call to action. What a portfolio-driven website looks like. Let’s break down a few portfolio-driven sites that showcase the creative’s style, process or point of view. 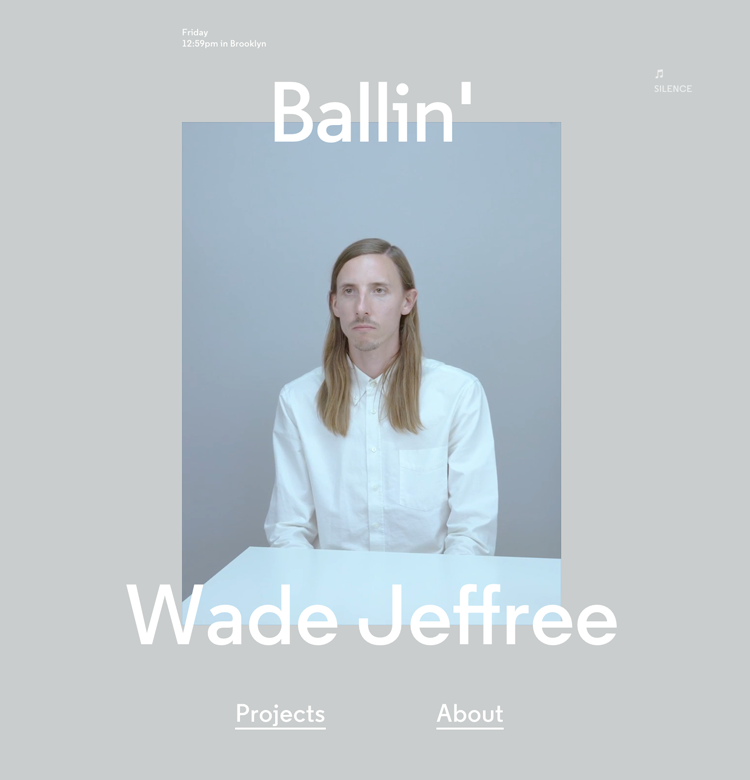 Wade Jeffree is an east coast designer and art director. His unconventional (it’s not a template, folks) web site presents his work in a unique and unapologetic manner. It’s entirely visual and interactive, with clickable layers to showcase the extent of each project. Click on the project images and you get to the project descriptions. The interactive site speaks volumes for his brand and his approach to his work. He talks a lot about why people brought their projects to him, but does not include testimonials on the site. Jeffrey includes brief project descriptions of a paragraph or two, rather than detailed case studies. Why this approach can work for you: Even if you have a conventional website, focusing on reasons why each of your clients reached out to you is the main take-away. Beyond testimonials, highlighting the why showcases the relationship and helps act as a filter. Clients choose creatives they think will be a good fit for them. A distinctly portfolio-driven site, Malika’s marketing approach focuses on her distinctive posterized stylizations. This is a custom site design, not a template. She includes a shop and links her Instagram in her header menu, but the entire body of work is showcased in a gallery on the home page. She includes minimal information about each project, and shows several different images of each design. Why this approach can work for you: If you have a distinct, unwavering visual style, your work sets you apart from other contenders. You can use a consistently-branded Instagram or Behance feed to showcase your work on your website. It’s a good way to integrate your social media with your marketing hub. Don’t take this approach if your work is varied in approach or media. Product and liquid photographer Bill Cahill shows a diverse and extensive body of work behind an animated home page. 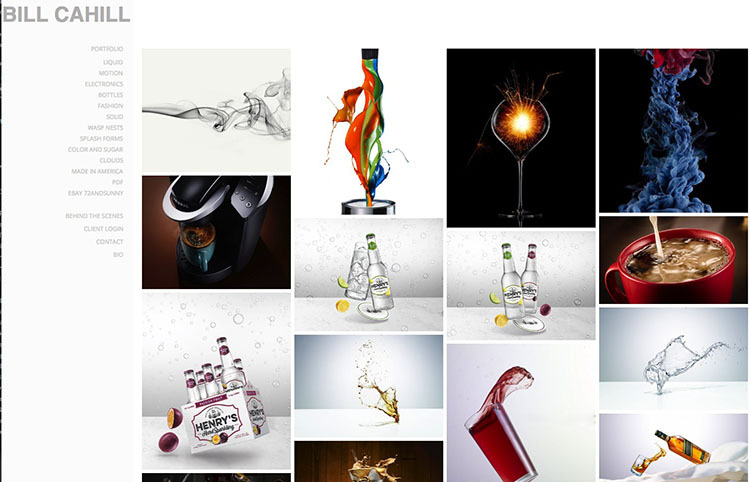 His technical skill with lighting, liquids and composition is the theme throughout the website. He included some behind-the-scenes clips showing how he sets up shots. Why this approach can work for you: If you have an obvious point of view, work in a broad range of subjects and have a number of works in each subject area, a filtered portfolio will work well. A broad range of work under one subject area communicates expertise and experience. What an agency-driven website looks like. 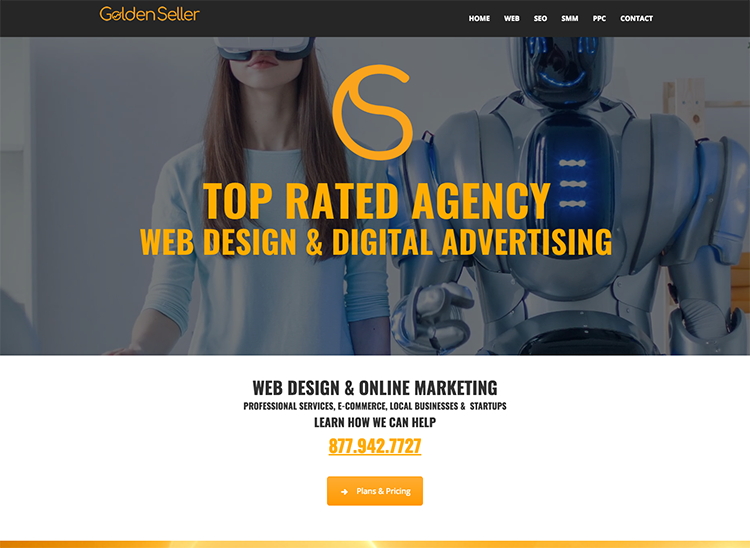 Golden Seller is a digital design and marketing agency. Their home page is all about their capabilities and awards. There is a good amount of text describing how they design to attract customers for their clients, (although a good bit of it needs proofreading). They do not include work samples on their homepage. While I don’t advocate that you lead with being a top-rated anything (what’s this based on and why does it matter), you can easily display and describe your menu of services and the results you achieve for your clients. Why this approach can work for you: Designers, writers and art directors: describe how your skills and expertise have helped (or will help, if you’re just starting out) your clients succeed. Take a client-centric approach in your copywriting. Don’t make your site all about how wonderful your work is, but about the results your clients enjoy because of your work. 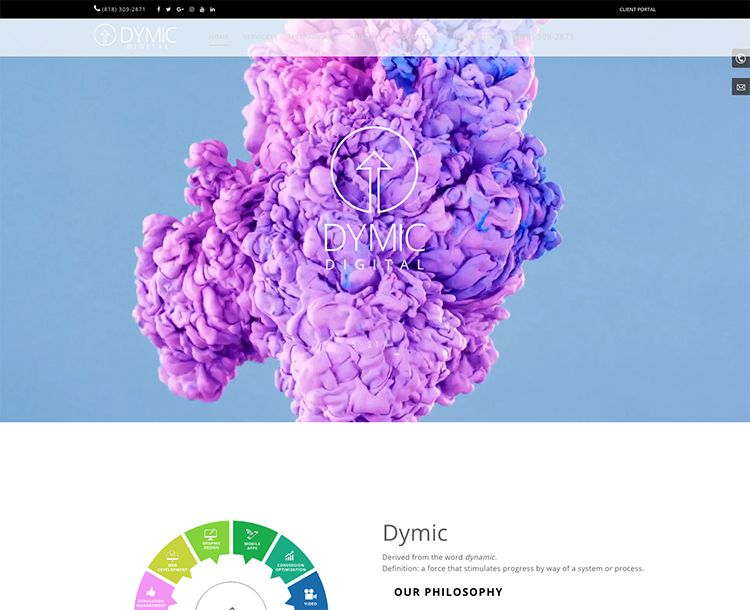 Dymic is a multi-person digital design and marketing firm offering a wide range of capabilities. The home page describes their philosophy and the types of clients they work with. They also discuss the meaning of the firm’s name and include a clip of their partners talking about their clients’ successes and how they work with their clients and solve their problems. They offer a free audit. Why this approach can work for you: Video is king. Including an informative sequence allows prospective clients to hear and see you, and provides another way to talk about your approach and philosophy. You present yourself as a person having a conversation. You can make the video an inter-view format, show your process, showcase your work, or all three. 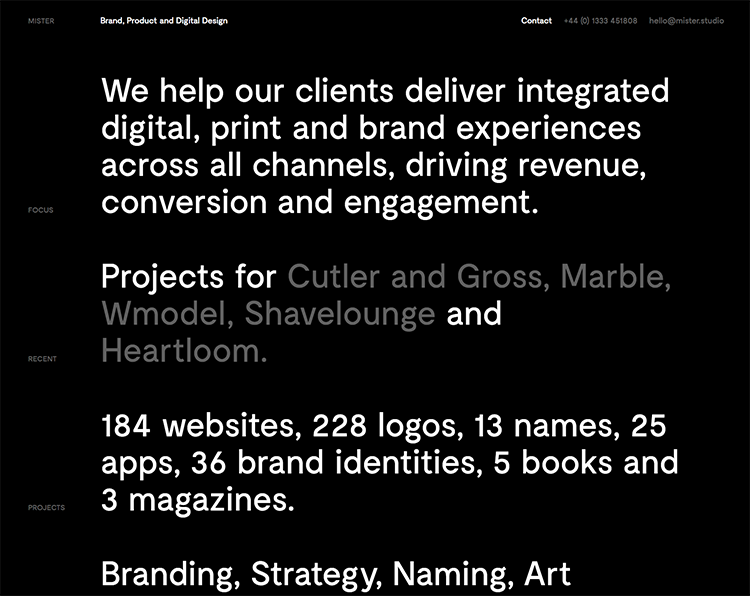 Mister, a digital and brand design firm, presents their brand promise and track record on a text-only, single-page site. This is clearly and agency-styled website. They do not include a gallery portfolio or contact page, but show their work as a promo reel. The portfolio is a multi-page fact sheet which visitors can download. Including a downloadable promo is not unique, but the only way to be able to scrutinize the work in this case is to do the download. The fact sheet includes some information about their approach and background, but the bulk of it shows numerous projects organized by category. Why this approach can work for you: Here we want to take a look at that fact sheet. Offering a free download (it’s not an opt-in) is one way visitors can interact with your site, and they can immediately have the promo in hand without having to subscribe to an email list or return again and again to the website. It’s a convenience. An agency-styled website is client-focused. Instead of showing off your talent or style and make it all about your creativity, you position yourself as a creative partner and problem-solver for your clients. You show less work but include more backstory. Prospective clients will want to know how yo think and if the work you create can really work for them. They’re coming to you not for your talent but your ability to help them succeed. You position yourself as a business, not an artist. When businesses and business people are your clients, you should demonstrate that you understand business and marketing. This problem-solving business mindset will attract better clients to you. If you are multi-passionate, you can include a range of disciplines in a single website. Instead of creating a different website or subdomain for each of your passions, you can bring that diversity together. You can market as both a copywriter and a photographer, or a designer and illustrator. What you want to do here is to communicate an overall approach to the home page that addresses all your disciplines without confusing your visitors. By positioning as an agency, this is easier to accomplish. The agency-styled website is not for everyone. If your work is distinctive enough, or your aim is to sell original artwork and fine art prints instead of creative services, lead with your body of work. But if you want to attract clients and help them accomplish their goals, or have a range of capabilities, create a website that will identify the reasons why businesses and organizations book creative pros and offer solutions to them. Lead with the problem-solving and back up your offer with a solid body of work. Your Turn: What do you lead with on your website — your body of work or your services? Have you thought about changing the focus of your website? Why or why not? Share in the comments.